Mayview, Missouri; 1943. From Fiegenbaum-Gerber family; all rights reserved. Front Row, from left to right: Esther Dinse; Doris Jean Carl; Loretta Smith; Lydia Katherine Begemann; Daisy Bell Vorwark; Grace Marie Horton; Margaret Matthews; Anna Mary Nolte; Marjorie Miller. 2nd Row, left to right: Ernest Willer, the music teacher; Margaret Bertz (eyes downcast); Elizabeth Rinne; Dorothy Lorraine Fiegenbaum; Willis Rinnie (in a sweater); August William Begemann; Robert Bertz (wearing glasses); Martin Tempel; Roger Nolte (with a big smile). 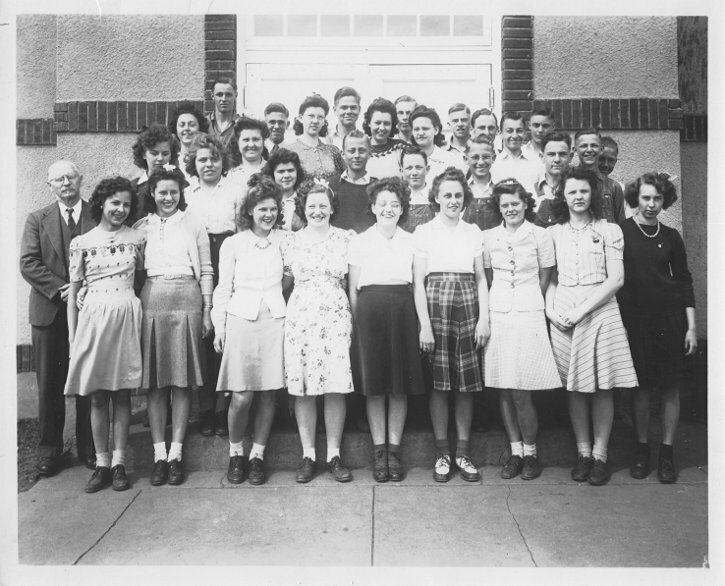 3rd Row, left to right: Lola Mae Jennings; Betty Tunnell; Emma Ellen Sander (in print dress); Emma Jean Schowengerdt [spelling? ]; Laverne Lockhart; Norman Tempel (partially hidden); Bobby Goetz (wearing glasses); Joe Sims (peeking out from behind Roger Nolte's shoulder). 4th Row, left to right: L. H. Tempel; J. W. Fiegenbaum; Earl Struchtemeyer; Raymond Fieth (partially hidden by Emma Jean Schowengerdt & Laverne Lockhart); Julius Rechtermann, Jr.; Richard Vorwark.